Welcome to our Pre-School Room! 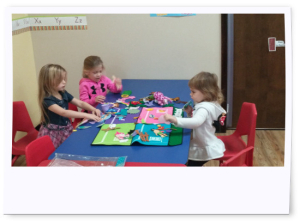 Welcome to our Preschool Classroom! We look forward to helping your child grow and develop. From ages 3 years to 5 years, your child will achieve many milestones. Social and independent skills become a major focus in their lives and imaginations soar! The activities we plan each day encompass quite a variety to meet your child’s needs and development. Some key concepts your child will learn include; both upper and lower case letters and their sounds, colors, numbers, shapes and patterning. Literacy plays a major role in our curriculum each day. Children begin to count and learn words in Spanish too. Math, science and social as well as small motor and large motor skills are also incorporated into our day. Circle time is held daily. This time includes the Pledge of Allegiance, the calendar, “Mr Weather Wheel” and show and tell. Please encourage your child to bring in a show and tell that is related to our daily theme. We go outside each day (weather permitting) so please dress your child accordingly. No laced shoes or boots. Only velcro is permitted and socks and sneakers are a must each day. A pair of fitted slippers are also needed for indoor play. These will be kept here in our shoe cubby. Please allow your child time to dress and undress himself at drop off and pick up. Your child will also need an art smock, small pillow and blanket and a full change of clothes. All these items will be kept in your child’s cubby. Children rest on a mat after lunch time and may have a quiet soft toy accompany them. A book bag and folder are necessary to transport “My Day Sheets”, art work & soiled clothing. It also helps your child feel important to carry it! Please remember that book bags are within the reach of children. Do not send anything that may be harmful such as medications, food or small items that can be a choking hazard. All medications must be labeled and handed to the teacher. All medications must be accompanied by a physician form. Please ask if you should need one of these forms. A specially prepared monthly menu is served to the children and is posted in the hall for your viewing. We also practice table manners and we have family style meals where the children pass the bowls of food and prepare their own plate! By age three, potty training should be complete or almost complete. Please send in pull ups and wipes in your child’s book bag if needed. Underwear is best! Read your child’s My Day sheet everyday and get involved with your child’s education now! Please view our bulletin board regularly and read our monthly news letter for Day Care information. If you ever have any questions, concerns, compliments or complaints we want to here from you! Feel free to discuss anything with the teachers or directors at any time. 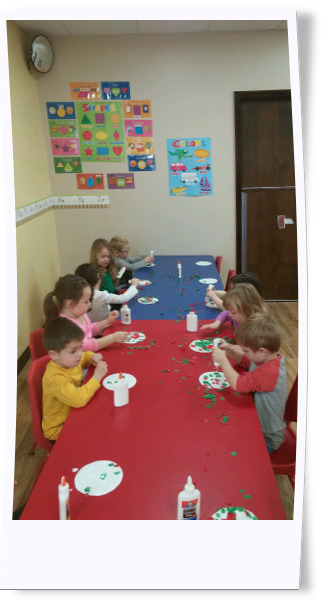 Thank you for choosing Candy Land Day Care and welcome to our Preschool room!